Traditionally known as an aphrodisiac and closely associated with witchcraft. Poisonous. Mandragora officinarum is a low perennial herb growing up to 30 cm high with yellow berries. It grows from a thick forked root which is known for sometimes resembling a human form. 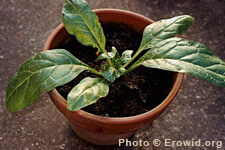 All parts of the plant contain hyoscyamine and scopolamine and can easily cause death by respiratory paralysis. It has a long history of medicinal and magical use in Europe.